Digital farming or digital agriculture is basically the use of IT in agriculture and it involves applications of connected machinery and other digital agriculture technologies. Digital farming is used to improve overall farm production, to improve financial performance and to help farmers to boost their farms productivity by means of advanced digital technology. Further, involvement of digital technology in farming is an evolution in agriculture sector and has positively impacted the efficiency and sustainability of the farms. Digital farming deals with use of biology and technology together in order to help farmers to do precise farming. Global digital farming market is anticipated to flourish at a remarkable pace over the forecast period i.e.2017-2024. Rising world population and rapidly decreasing arable land are some of the major factors which are propelling the growth of global digital farming market in order to improve overall efficiency and production of available arable lands. Geographically, global digital farming market is segmented into five major regions including North America, Europe, Asia Pacific, Latin America and Middle East & Africa region. 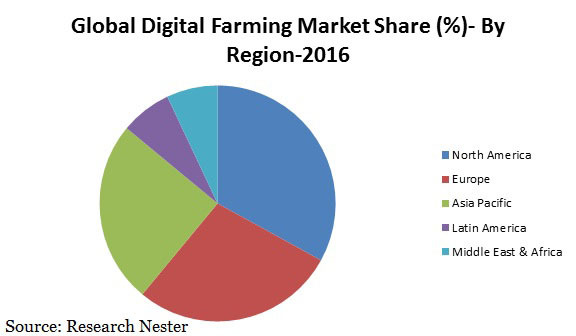 Moreover, North America region accounted for a major share of the global market and is dominating the global market of digital farming market. High investment in research and development in advanced agriculture techniques and presence of some major players in digital farming solutions are expected to be the major factors behind the growth of digital farming market in this region. Global digital farming market is primarily driven by factors such as growing global population and rising need for effective agriculture solution which can boost efficiency and production of arable lands. In addition to this, rising penetration of advanced technologies in agriculture sector coupled with growing need for high production of grains and vegetables are key factors which are likely to drive the growth of global digital farming market. Additionally, increasing population of green farming across the globe is fueling the growth of digital farming market. Moreover, additional benefits of digital farming such as livestock monitoring, precision farming, higher productivity and low investment are fueling the adoption of digital farming globally. Further, these additional benefits of digital farming are likely to drive the growth of global digital farming market. Rising demand for quality crops in amount to meet the growing need of grains and vegetables is also a major factor which has led farmers to adopt digital farming solution at their fields in order to improve productivity of arable lands. However, high cost of digital farming solutions resisting the adoption of digital farming among the farmers. This factor is a major challenge to the digital farming market and is likely to hamper the growth of global digital farming market. Apart from this, lack of awareness towards digital farming is also a major factor which is likely to dampen the growth of global digital farming market in near future.